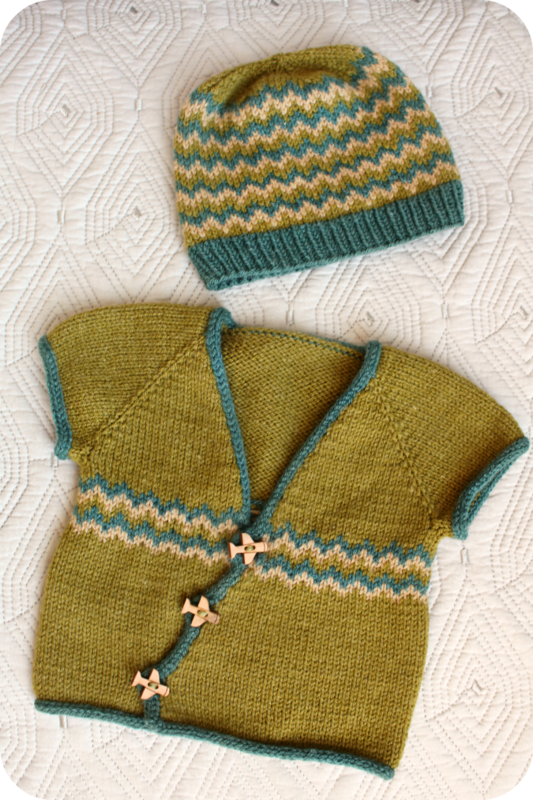 I recently knit up this sweet little set as a gift for my cousin's soon to be born baby boy. This is the Hello Kimono and Wee Hat pattern from Kate Oates new booklet, "New Guy" and I loved every second these were on my needles! It has been maybe years since I did stranded colorwork in my knitting. Now after this project, I feel obsessed. 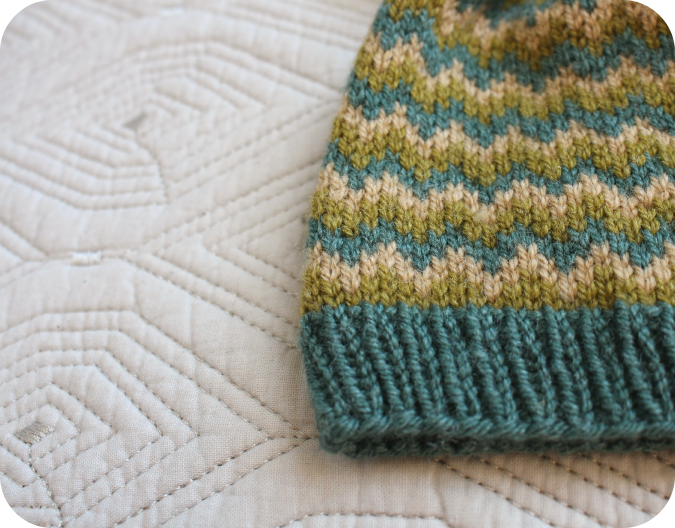 Now I am spending my evenings pouring over colorwork patterns on Ravelry. It's nice to change it up once in awhile. For this project I used Quince and Co. Tern in Kelp, Aventurine and Popham. My favorite part of this little set are these sweet rocket-ship buttons. I purchased them months ago from Monarch Knitting in Pacific Grove and was happy to finally have a chance to use them. I just gave my cousin this set at her baby shower this last weekend with a few pairs of hand-sewn baby pants. love the buttons--perfect! And the colors are so vibrant. Really beautiful! They are a beautiful gift! 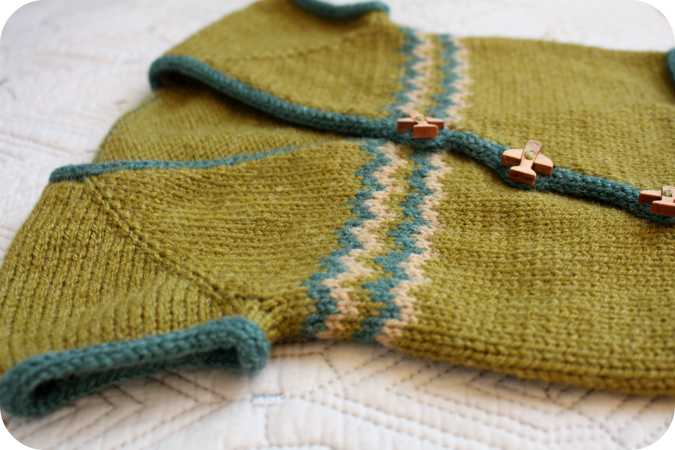 I'm off to check out the patterns- I've been on the lookout for good baby knits! Exceptional knits! The love just shines through! That's so cute! The buttons are a lovely addition! That is amazing! And the little buttons are too cute! such a beautiful hat and vest combo! 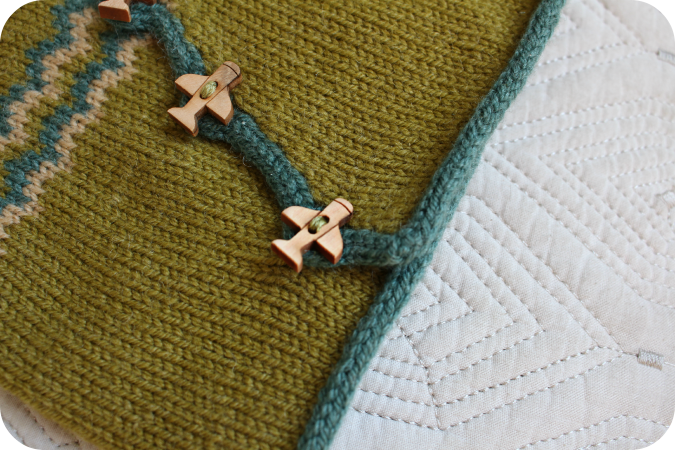 I love those little wooden airplane buttons, they are the perfect finishing touch. So cute! The airplane buttons make a lovely finishing touch. Those are excellent buttons! I too have a policy of buying buttons in advance, just in case. I'm still not sure when the whales I bought a couple of years ago are going to get used though.